This year marks 20 years of Eric Powell’s beloved, pulpy supernatural comic series, about the titular Goon protecting the world from threats of the ghostly, undead varieties. The Goon is kicking off anniversary celebrations in style with its first comic series since 2015, and io9's got an exclusive look inside the first issue. Published by Albatross Funnybooks, the new Goon ongoing sees the Goon—with Franky in tow—return to the Town with No Name after an overseas adventure (one that has yet to actually release—it’ll be told in a graphic novel). The primary cover for The Goon #1. Thinking they’ve spared the place from the onslaught of evil after the culmination of the last Goon series, they’re surprised to find that...well, literally nothing has changed. The dead still stalk the streets, and there are still monsters and maladies to be fought. Otherwise there’d be no new Goon series to be had! 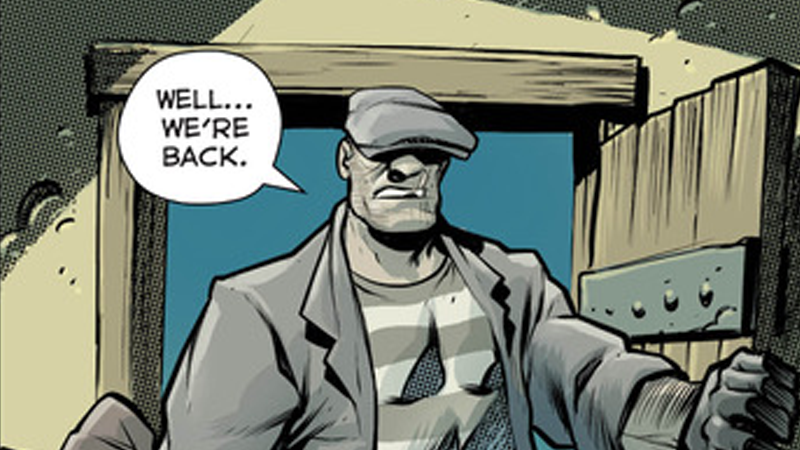 Check out their arrival back in town in our exclusive look inside The Goon #1 below. The Goon’s return kicks off a wave of 20th anniversary celebrations when issue one hits shelves March 13. Exclusive details on David Fincher&apos;s Kickstarter campaign for his zombie movie The Goon!